On the same day Americans were summoned to ‘ask not what your country can do for you, but what you can do for your country’, John Fitzgerald Kennedy sat down for his first meal as 35th President of the United States. 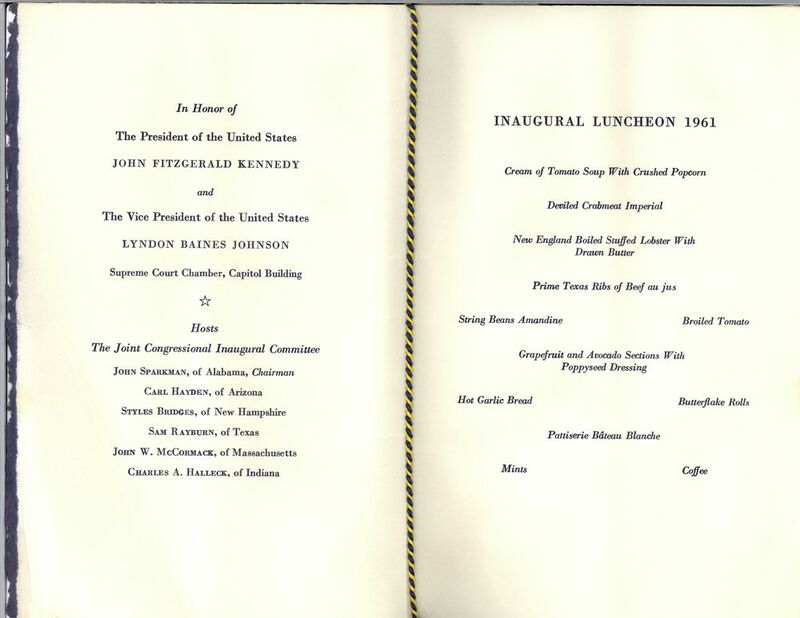 After starters of creamy tomato soup and deviled crab meat Imperial, the next course catered specifically to the new Executive Branch of JFK and LBJ: New England boiled stuff lobster with drawn butter and prime Texas ribs of beef au jus. 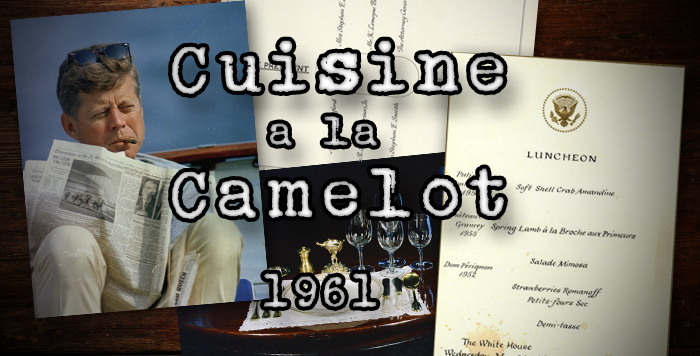 This was the beginning of Cuisine à la Camelot. 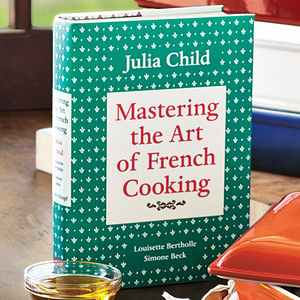 It was 1961 and Julia Child was at the height of her popularity after releasing volume one of Mastering the Art of French Cooking. 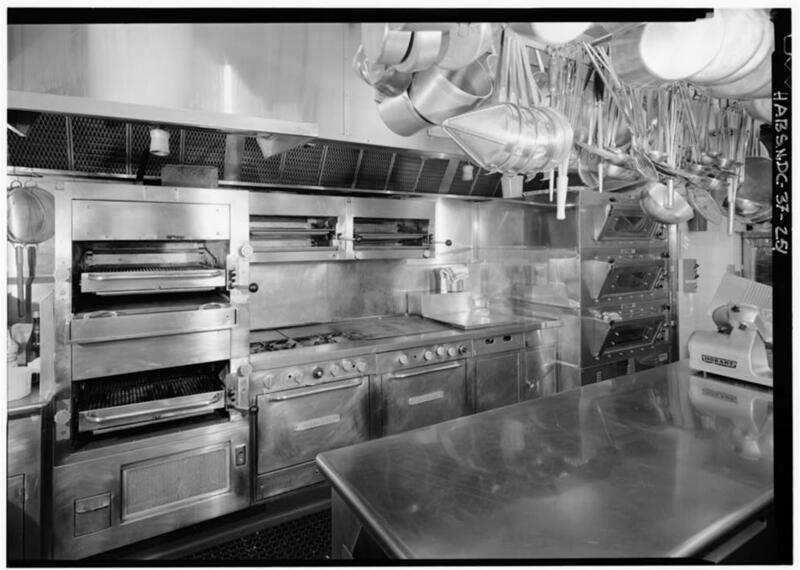 Anything French was distinctly fashionable throughout American culinary circles. 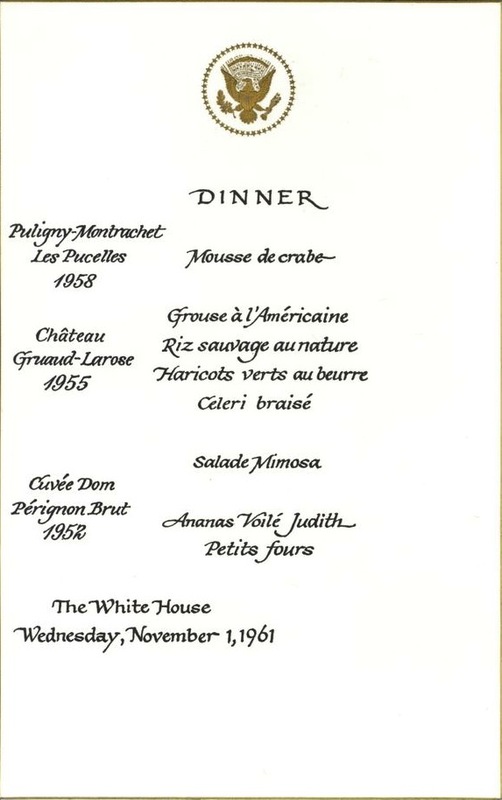 So it is no surprise that many dishes served to the Kennedys and their guests paid tribute to White House Chef René Verdon’s Parisian roots. With casseroles of the 1950s clearly out-of-style and the ration books of the 1940s a distant memory, the new administration was a clear shift from the previous era symbolized by Truman and Eisenhower. Chef Verdon took over an operation previously run by caterers and Navy stewards not known for producing quality dishes and transformed it into the modern White House kitchens we know today. 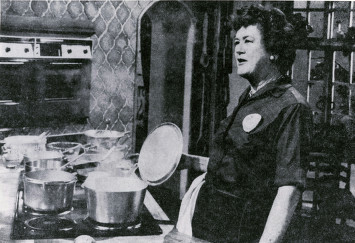 Promoting local fresh foods before it became fashionable, his kitchen staff cemented the Kennedys as hip culinary trend setters – resulting in many suburban housewives making soufflés, pâtés, and pork rillettes for their own dinner parties. For the visit of Korean General Chung Hee Park, a lunch that can be described as classical upscale French cuisine meets Southern style cooking was served. It featured snails in brown butter parsley sauce, barbecue chicken, potatoes, and creamy mushrooms. A simple yet elegant lunch filled with the charming rustic touches of an open grill. (Left) White House Executive Chef René Verdon (third from left) and members of the White House kitchen staff pose with an assortment of cookies. 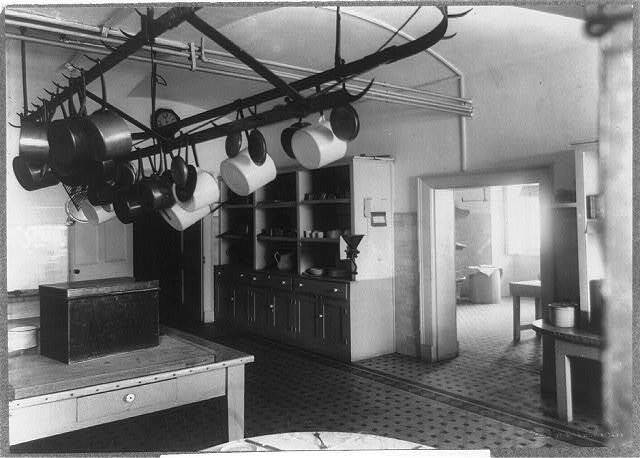 The kitchen went through numerous renovations in the 20th Century. The kitchen in 1901 (middle) and in the 1950s (right). And during most of 1961, the Kennedys drank almost exclusively French Wine and Champagne. 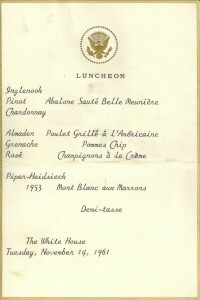 An example wine menu from the 1961 White House gala in honor of former President Harry Truman: 1955 Château Gruaud-Larose – an underrated vintage of pure cedary Cabernet second growth, St. Julien styling, 1958 Puligny-Montrachet Les Pucelles – a Chardonnay with pronounced notes of creamy buttered apples, and 1952 Cuvée Dom Pérignon Brut. 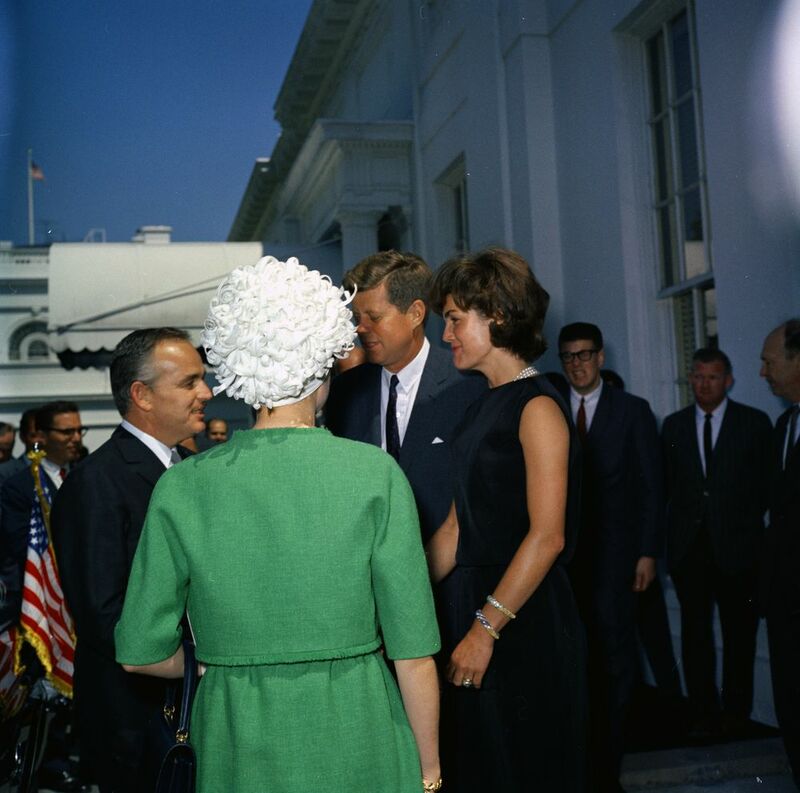 It is no surprise that Jack Kennedy loved Dom — the same drink consumed by a fictional spy named James Bond in the Ian Flemming novels that the president devoured. And while Agent 007 preferred a ’53, the 1952 served at the White House was a long aging firm rich year when there was still some barrel fermentation for complexity. 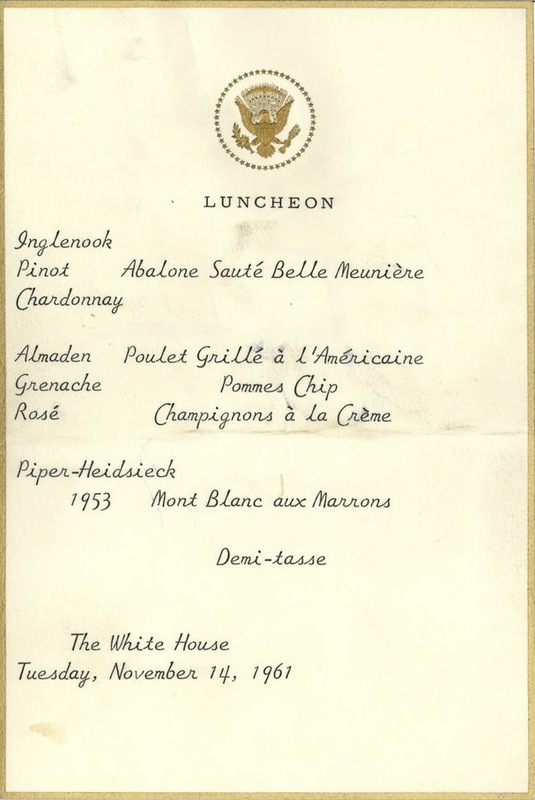 In an era before Twitter, cell phone cameras, and a tabloid media, the press largely complied with the Kennedys’ request that the wine list from White House functions not be printed in the next day’s newspapers. 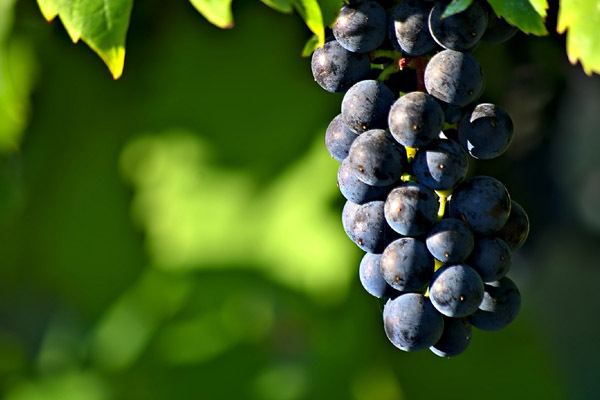 However, when word began to leak that no American wines were being consumed, public pressure convinced them to start serving wine from the United States and more specifically California – a region that hadn’t yet exploded into the mainstream. At the table with his guests however, Kennedy was not always on top of his game in terms of dinner diplomacy. 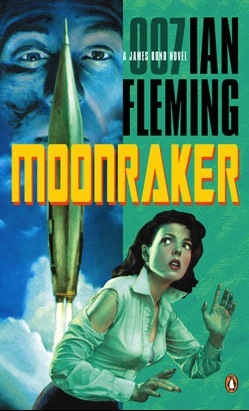 When Monaco’s Prince Rainier III and his movie star wife Grace Kelly stopped by in 1961, the president worried about mispronouncing his name “Prince Reindeer.” Months earlier, he had enraged Canadian Prime Minister John Diefenbaker when at the White House, he called him in front of the entire press corps “Prime Minister Dee-fen-bawker.” He did not want an incident like that to occur again. (Left, Middle) Prince Rainier III and Princess Grace of Monaco Arrive at White House for a Luncheon in Their Honor. 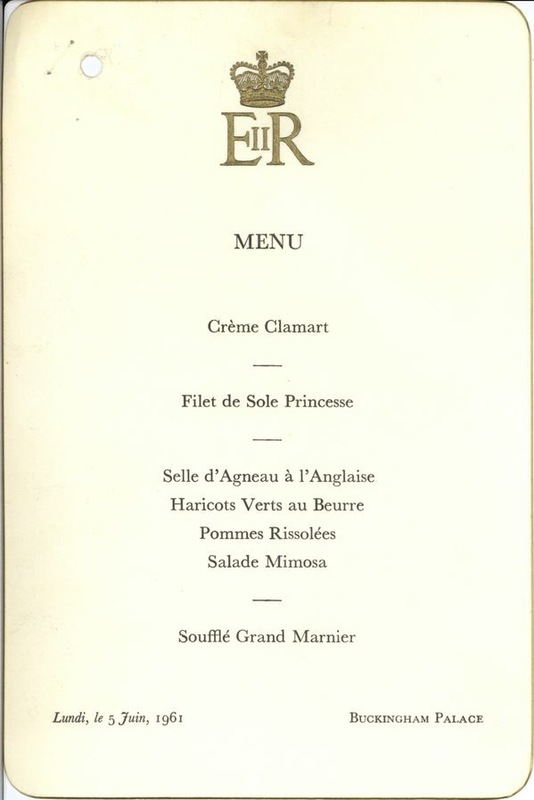 (Right) The menu for their visit. 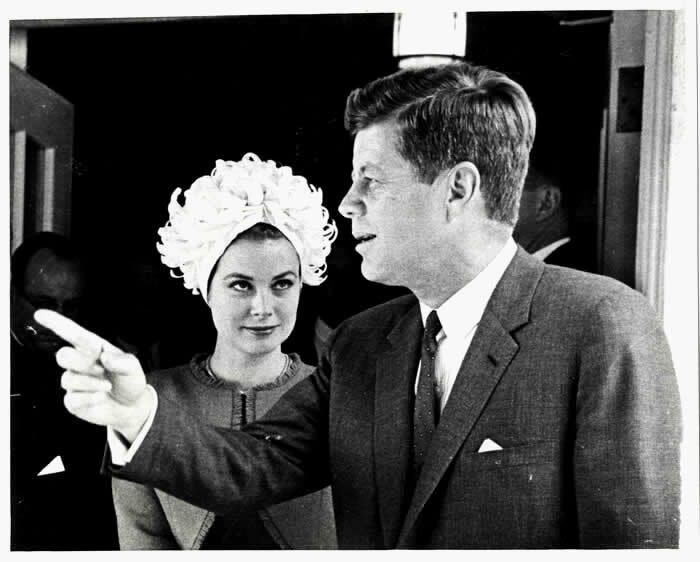 But as they enjoyed their light lunch of Salade Mimosa, Soft Shell Crab Amandine, and Spring Lamb à La Broche Aux Primeurs, JFK accidentally responded to the Prince with “Prince Reindeer” in his signature Bostonian accent. 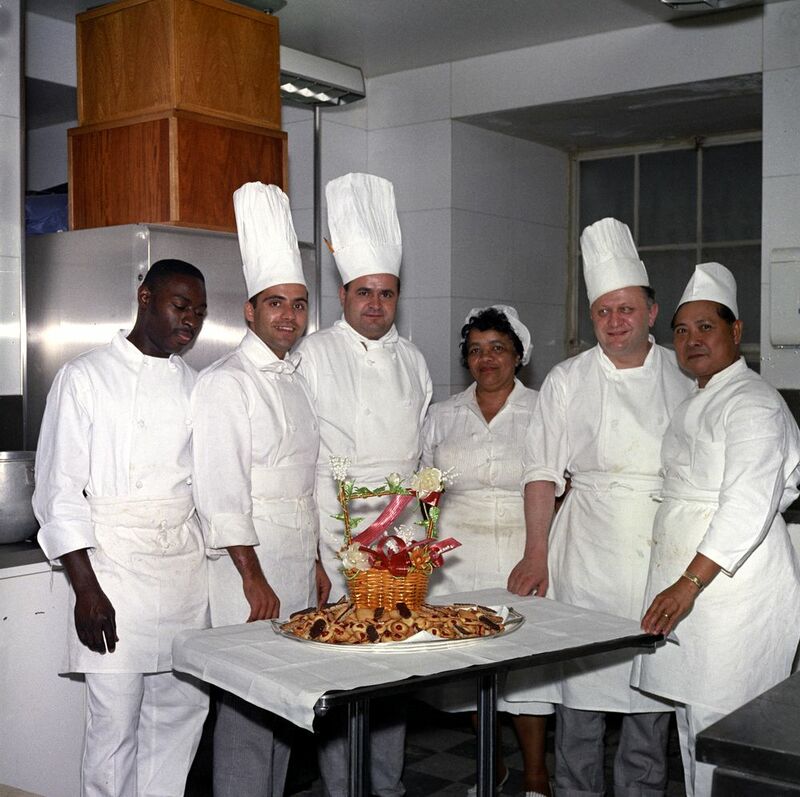 Thankfully, the gaffe was short-lived when in an interview four years later, the Princess recalled every detail of the lunch including all the dishes she had eat – a clear sign of success for Kennedy’s kitchen staff! 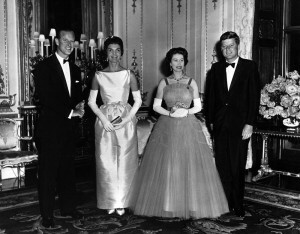 Away from Washington, JFK and Jackie were treated to an impressive feast at Buckingham Palace. It was 5 June 1961 and a little over a month since the disastrous Bay of Pigs invasion. The previous day in Vienna, Kennedy had stared down Nikita Khrushchev in a high-stakes game of nuclear diplomacy over Berlin – setting the stage for future confrontations in 1962. So with Queen Elizabeth and Prince Philip by his side, the president ended his European charm offensive by enjoying some very royal dishes. (Left) Prince Philip, Jacqueline Kennedy, Queen Elizabeth and JFK pose for a photo at Buckingham Palace. 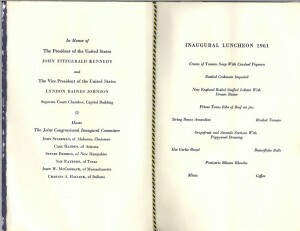 (Right) The menu from that event. Beginning with creamy pea soup, hollandaise sole garnished with asparagus second, lamb and buttered green beans was served as the main course. 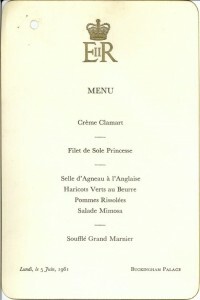 This seemingly simple menu would have been masterfully executed with classic French techniques to impress Her Majesty and guests. Not only did the many refined sauces showcased make precision timing critical, the showstopping Grand Marnier soufflé served for dessert is one of the most difficult dishes to execute for such an expecting crowd. 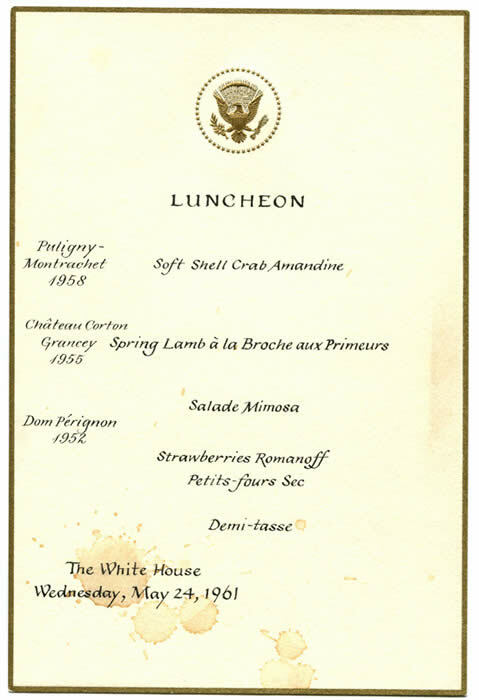 Clearly, 1961 served as transformational year for food and wine served in the White House; 1600 Pennsylvania Avenue was now on the cutting edge of the culinary arts. 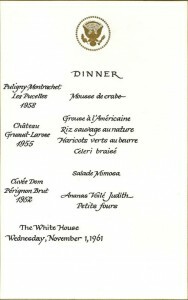 An exclusive team of superb cooks, headed by a French chef, would shape food and wine served even today to the modern Presidency. 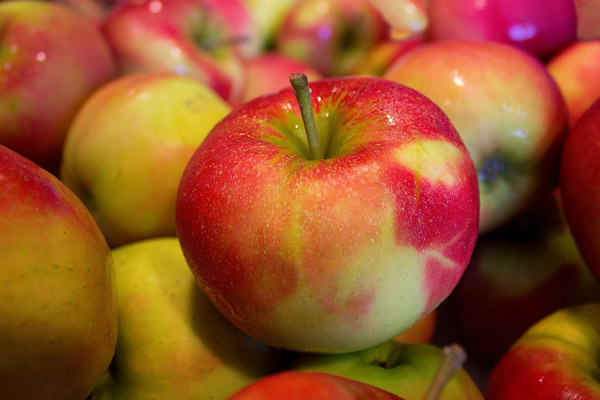 Please have a look at the pictures and menus on this page by clicking to enlarge them. Also, vote for what you think is the best dish served during this year and leave your comments. Special thanks to Sid Cross who helped to provide information on the wines. 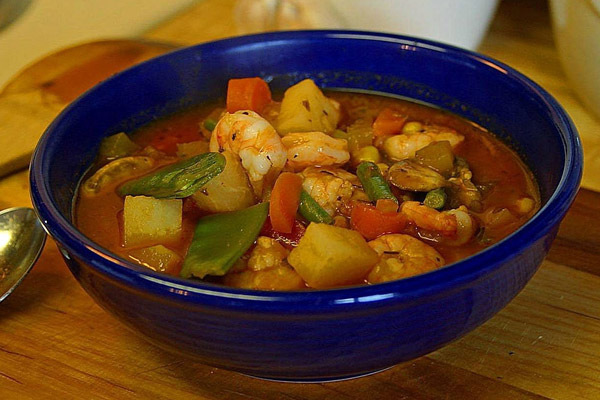 What dish would you like to recreate from this article? Every year seems to bring up new special anniversary wine tastings. Next year undoubtedly will include a focus on how the 1989 Bordeaux and underrated Burgundies are doing at 25. This year I attended several enjoyable events spotlighting 1983 red Bordeaux at 30 years! Coming right after the ripe concentrated consistent 1982 was a tough task. The 1983 micro climates varied really favouring the southerly drier Medoc regions of AOC Margaux & Pessac-Leognan. Also the hot humid conditions in August resulted in some grape rot & mildew especially where the principals were away on their annual vacation rather than at home in the vineyards like May de Lencquesaing of Pichon Lalande. Their wine is in my opinion the best most complete complex Pauillac in 1983 edging Mouton (cedar) and far better than Lafite (paler and drier) and Latour (atypically light herbal). 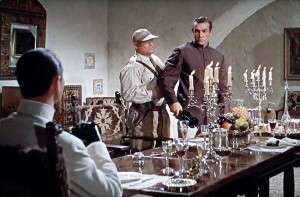 What about the wine of the vintage? 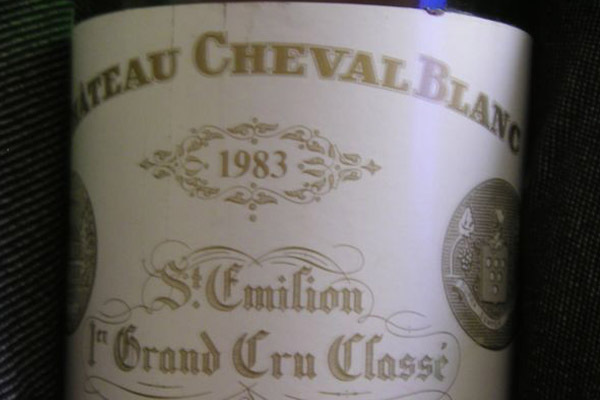 Domaine de Chevalier and Haut Bailly are typical of a certainly better 1983 than 1982. However Haut Brion & La Mission both show better in 1982 than 1983. Not outstanding on the Right Bank. There are some delicious elegant wines from the Margaux appellation in 1983. Palmer is a star but I have found bottle variation recently as it ages. Served to me blind against Chateau Margaux (and other 1983 wines) twice in the last few months Palmer was both times lighter in colour less structured and less aromatic than Chateau Margaux – a real classic. Robert Parker prefers Palmer and I agree with him that Chateau Margaux 1983 can have “cork” issues. Still I prefer 1989 Palmer over 1983 – and of course that marvellous trio of 1970, 1966, and 1961. My vote now for what can be THE wine of vintage 1983 in Bordeaux is Chateau Margaux. One of their many successes under the brilliant Mentzelopoulus & Pontellier team! Post your vote for the Bordeaux wine of the 1983 vintage. Your thoughts on how they are aging. Have you tried a 1983 Bordeaux?